Even as online enrollments continued growing (3 percent last year) while overall higher education enrollments fell, a new survey among deans and directors has uncovered a "mismatch" between the online programs they help deliver and student preferences. For example, while online students have expressed demand for credentials in computing and IT or health and medicine, respondent schools have shown a preference in their online program choices to focus on social science, criminal justice and law. Also, while students pursuing online courses want financial aid, 57 percent of respondent schools don't offer scholarships. These kinds of disconnects, according to a report on the findings, result in "mass-market opportunities that are being lost" by the institutions. The project was undertaken by theAssociation for Continuing Higher Education (ACHE) and Learning House, a company that manages online programs for colleges and universities, among other services. The latter organization already co-produces "Online College Students" reports, a similar research effort that surveys preferences for online students, with Aslanian Market Research. The latest survey, intended to offer a comparison to the broader research and to serve as a baseline, was based on responses from 116 individuals whose institutions are members of ACHE. Among those members, 88 percent offer at least one fully online degree program and 11 percent have hybrid programs. While 42 percent of members have master's degree programs and 31.5 percent deliver bachelor's degrees, just 2 percent offer associate's degrees. Two-thirds (69 percent) of association members with at least one online program lack online degrees in STEM fields. Likewise, a tenth of online undergraduates want an arts and humanities program, but half of respondent schools with online offerings don't include them in their online programming. The majority of respondents said that two barriers impaired the success of their online course efforts: 71 percent said their students need more discipline to succeed in online courses; and 58 percent said that greater faculty time and effort was required to teach online. Other challenges mentioned included the cost of developing and delivering online courses compared to traditional classes, a lack of acceptance of online instruction by faculty, and questions about ownership of intellectual property. At the top of the stack of hurdles respondents faced in serving their online populations was retaining students; this was referenced by 53 percent. That was followed by training and recruiting faculty to teach online (47 percent). The survey found that nearly all respondent schools (97 percent) provided some form of training on the learning management system; 91 percent offered instructional design services; and 77 percent made instructor training on online pedagogy available. The bulk of those training services are offered in online and in-person forms. 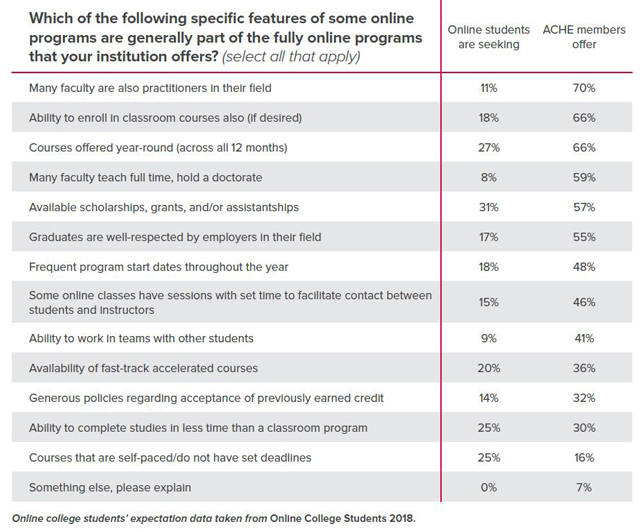 Nearly half of ACHE members (47 percent) said their institutions incentivize instructors to develop online courses; and those with five or more online courses are more likely to do so. Interestingly, the term "distance learning" may no longer apply to online programs. Most online students (66 percent) in ACHE member schools live within 50 miles of the physical campus in which they're enrolled. Only 13 percent are more than 100 miles away. Faculty training needs to be extended beyond the initial course design and platform training. The report is available with registration on the Learning House website.